Full just doesn’t feel right until pureed pumpkin is involved. Sure, you can go out and get yourself a pumpkin spice frappuccino, but it’s just not the same is it? I prefer something you can sink your teeth into…like Mini Pumpkin Pies, Pumpkin Rolls, and Pumpkin Custard. Or like these pumpkin bars with a gingersnap crust. You can make the basic recipe, which is like biting into mini pumpkin pie bars. They’e smooth and creamy and everything you want in a fall treat like this. Or you can make them with a caramel layer between the gingersnap crust and the pumpkin filling. The caramel melts into the pumpkin filling, making it super sweet. And if you refrigerate them, tiny pockets of crunchy caramel develop, which is just so much fun to bite into. 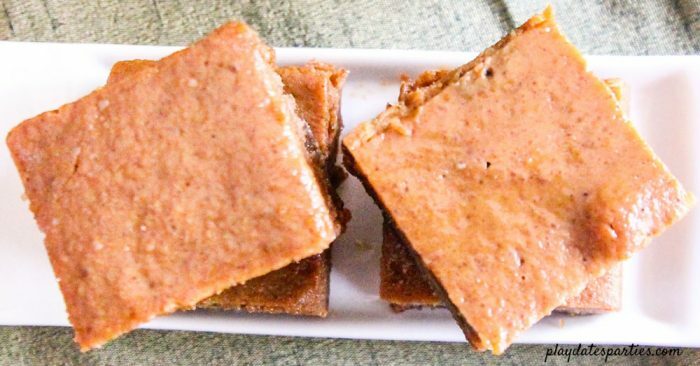 Seriously, pumpkin bars with a gingersnap crust are totally addictive. Combine the cookie crumbs and brown sugar. Add to the pan and pour melted butter over top. Combine butter and cookie mixture, pressing into bottom of pan until you have an even layer covering the entire pan. Bake the crust for 10 minutes, being sure not to overcook. Place unwrapped caramels, milk, and butter in a double boiler (A metal bowl fitted over top of a pot with about an inch of simmering water. Try to ensure that the water does not touch the bottom ofthe bowl). Stir until the caramels have melted and fully incorporated with the milk and butter. The mixture should be fairly thin. When the crust is ready, pour the caramel mixture over the crust and spread evenly to the edges of the pan. Pour evenly over caramel layer. (Don't be surprised if the caramel layer rises up the sides of the dish. It will still taste great. After the 15 minutes are over, reduce oven temperature to 350 and finish cooking for an additional 35 minutes. The bars are finished cooking when the top is firm and the filling no longer jiggles in the center. These bars are best when refrigerated and eaten a day or so after baking. 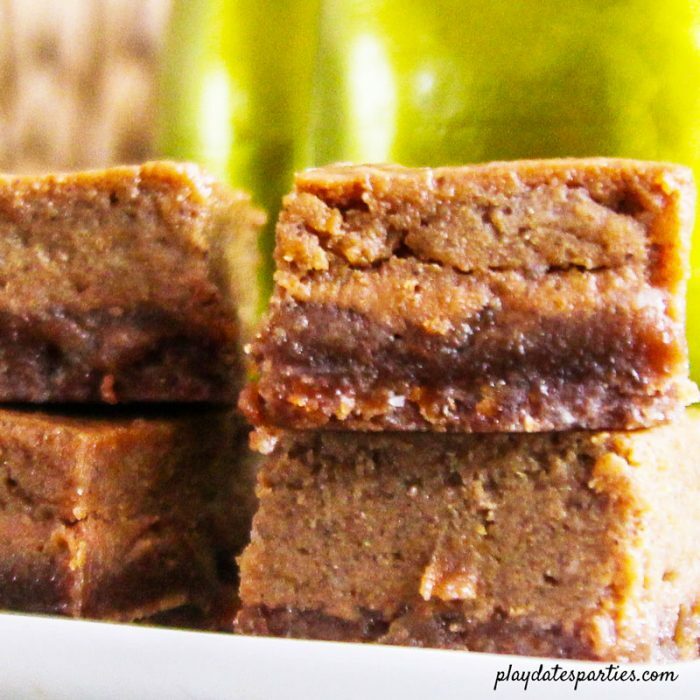 Have you ever made pumpkin bars with a gingersnap crust? These look great. Perfect for Halloween! I will definitely be trying these. Those sure sound delicious! I am so glad it’s almost Fall cause now I get to indulge in more pumpkin treats. Oh yum! These look delicious! I’ll have to add this recipe to my things to make this fall! Thanks for sharing at #SmallVictories linkup! They look good. We always make our own pumpkin puree from the many pumpkins and squash that we grow or purchase. We are always looking for new recipes. Thank you for sharing and I have pinned it. I’m so ready for fall flavors and spices! I bet these are so yummy! They are delicious! Thanks so much for stopping by! These sound so yummy! I love anything with pumpkin so thank you for sharing. So glad you like it and thanks for stopping by! Oh my! Getting in the mood for pumpkin and these look fantastic. Love the addition of caramel! It’s getting to be that time! I was definitely surprised at how the caramel changed the texture more than the flavor. I guess it’s time for me to admit that fall is coming and that our hot weather will soon be behind. 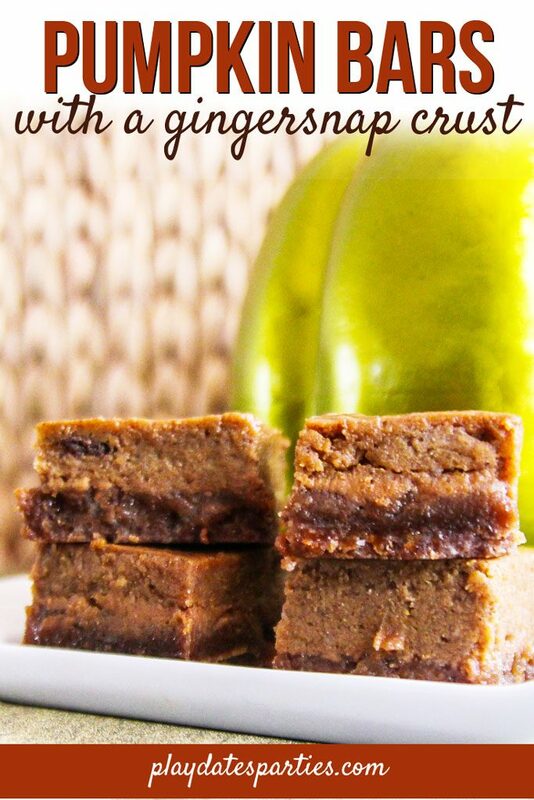 I think I’ll drown my sorrows in these amazing pumpkin bars. Thanks for joining us each week at Celebrate Your Story and have a wonderful weekend. It almost feels like fall has arrived here…we’re actually going apple picking tomorrow. Can you believe apples are ready to pick?! Thanks so much for stopping by! Mmmmmmm, mmmmm, mmmmm these pumpkin bars sound so delicious Leslie. I’ve got a bit of a sweet tooth so they caramel coated ones really appeal to my taste buds. 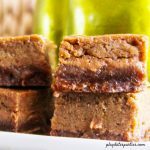 I’ve got a massive sweet tooth, so adding the caramel to the bar seemed totally natural. ? Thanks so much for stopping by! This looks like the perfect fall recipe! It is definitely perfect for fall…good thing the temperatures have already started falling here. I hope you get to experience a little bit of early fall where you are. ? These look so tasty. I could just try one now. Thanks for sharing at creative Mondays last week. 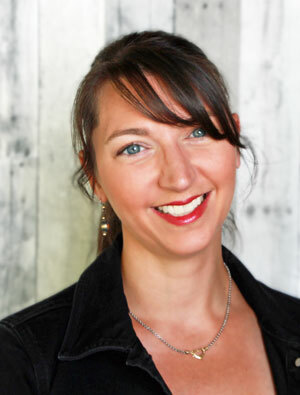 You are one of my featured blogs tomorrow. Thank you so much! I hope you do get to try them soon, and am so grateful for the feature! These look and sound so good!! Pinned! Thanks for Sharing at the What’s for Dinner Party! YES, please!!! These sound amazing! Love ALL the pumpkin. This looks so delicious and I want some right now! I can’t wait to make these and sink my teeth into some yummy pumpkin goodness! I bet these smelled delicious as they were cooking! 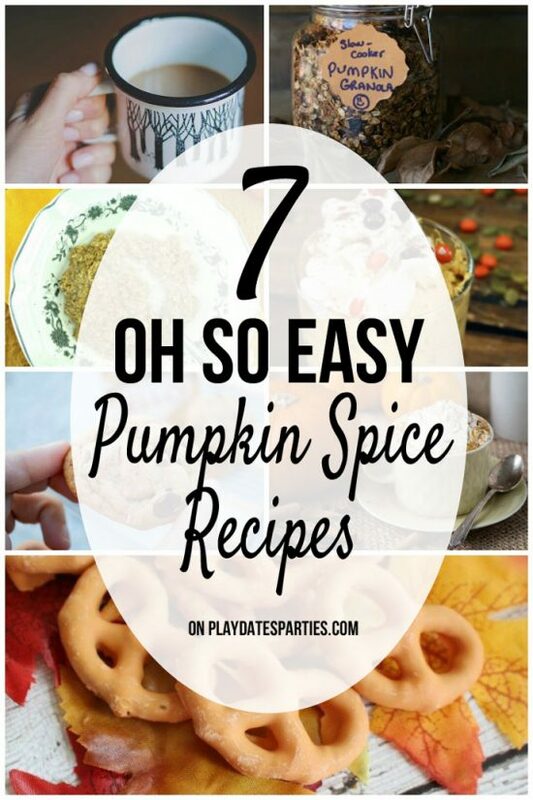 I’ll be ready for pumpkin time with all of these mouth watering recipes! I’m so ready for pumpkin season!! These look delish. Thanks for sharing on Foodie Friday! Pumpkin and ginger, oh wow!! 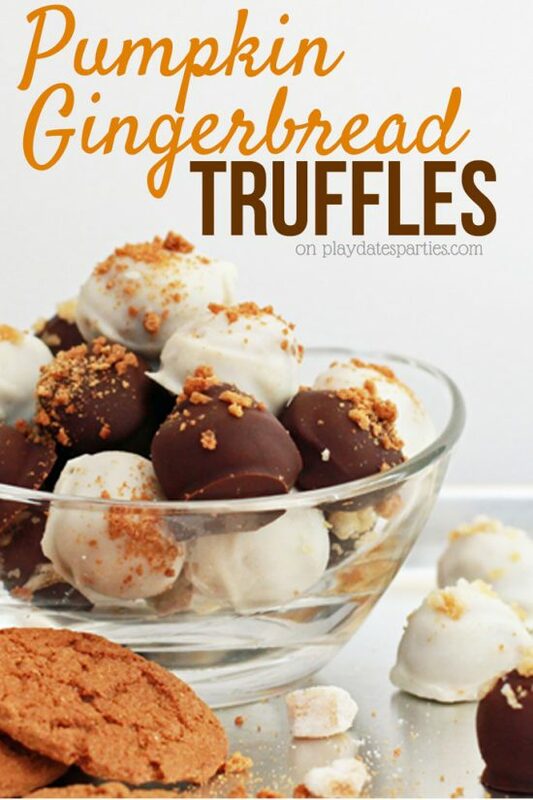 I am definitely pinning this recipe. I’ve pinned this for experimenting to make a Peachick safe version as these sound AMAZING! These look fantastic! Thank you for sharing at #FiestaFriday – I’m sure they would please a whole crowd. This sounds wonderful with the gingersnap crust. Thanks for sharing it on Merry Monday. I bet this is so gooood. I am so ready for pumpkin season! Thanks for sharing on Foodie Friday! These are making me look forward to fall!! !